October News – Senior Infants – Midleton Educate Together N.S. 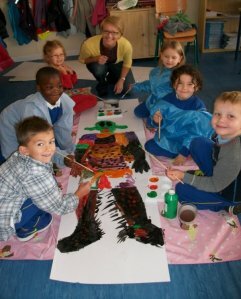 This month Múinteoir Amie and Múinteoir Diane’s Senior Infant pupils were fortunate to work on a Halloween Art Project with a very talented parent, Joanna. They designed a witch and a monster portrait. The children worked in groups of six and they had a fantastic time tracing the portraits and using paint and their imaginations to design it. They really enjoyed working together and we are very grateful to have Joanna in our class. We are looking forward to seeing her return at Christmas to complete another Art Project with the children. Please keep an eye out on our blog to see their wonderful work!